Muckross Stables was quaint and delightful. The food was very good. It was a beautiful setting. We enjoyed our visit and would go again. We loved the location of this B&B! We enjoyed a trail ride in Killarney National Park while there.It was wonderful meeting the family and enjoying all of the animals on the farm. Thank you for a lovely stay! What a great place! Patricia was lovely and made an excellent breakfast both days! The room was spacious, clean and wicking. Our family of four fit with extra room! For families with kids, they have an awesome playground out front. Thank you for this awesome stay! Quiet setting, friendly hosts. Close to Killarney Park. Easy to get to. Modern rooms, ensuite with TV. Comfortable. Muckross is conveniently located to many destinations in the area while having the privacy of a secluded B & B. The setting was very nice with animals to see and pet. The rooms were clean and service a pleasant experience. Breakfast afforded a wide variety to choose from and was always very yummy. We had a nice stay! Pleasant hosts, and we were able to see new puppies and the horses in their stables. Good breakfast, nice room, no complaints. lovely place in an good area, near the national parc of Killarney. Good breakfast, nice people. Ein perfekter Ort für einen perfekten 5-tägigen Aufenthalt im Killarney NP. Jederzeit freundliche und zuvorkommende Vermieter. we have a very nice stay at this B&B, rooms clean and confortable, great breakfast and warm welcome. What a great find! We spent two nights at the Muckross Stables B&B and loved it. Our room was comfortable, and we woke up both mornings to the sight of horses grazing outside the house! Breakfast was very good. We would definitely recommend this B&B, and wish we would have stayed longer. My husband and I visited for 2 nights in May 2016 and found it to be a wonderful experience. We had a very comfortable bedroom and the house was very clean and nicely decorated. We very much enjoyed meeting Maureen and Paudie and their extended family; we felt very at home. Horse riding is not their first priority, but we so enjoyed all the animals on the farm. Hiked to see Irish red deer nearby. I visited in September 2013 with my two daughter's. We Loved Muckross. Staff was wonderful. Loved the animals. Accomodations were very comfortable. Excellent and welcoming B&B. Fantastic and filling breakfast. Loved the farm animals on the property. Loved the location and proximity to sights. Lovely location, excellent hosts, good variety for breakfast. Good location for access to local sites of interest. This place was amazing! They were very welcoming and accommodating. The farm was such an added bonus! A beautiful park in which it is pleasant to walk there to greet its occupants. Maureen and Paddy have a warm and discreet welcome . The kids loved the puppies and our youngest really regretted leaving. A stay both relaxing and full of emotions . I highly recommend ! Very nice place for those who love animals. Good to be outside city but at the same time close enough for dinner in the town or just shopping. Familly running the farm was kind and helpful all the time. We had a lovely time at Muckross Stables. Great hosts, great breakfast, great activities for the kids, and a gorgeous property. We stayed five nights and would stay more. Thanks Maureen! Very friendly, caring and informative staff. Interesting and scenic location, with lots of animals. I really enjoyed my stay here. Nice place with pets, near Muckross and Torc Waterfall. Comfortable beds and good greakfast. The kids favorite B&B. Teen daughter loved the puppies, ziplines, & feeding the red deer and horses a little handful of hay. Authentic loving Irish Grandma provided hot tea, a hot water bottle & extra blankets, home-cooked meals for my adolescent son as he rested while his sister and parents trekked out to see Kilarney and our pre-booked B&B in PortMagee & Skellig Island trip. Comfortable, great breakfast, relaxing, and definitely affordable. Très bon accueil, chambre parfaite, environnement calme et reposant. A retenir. Fantastic place. So welcoming! Everything was spot on from the start to the end! Loved it bits! will come back for sure! Our stay at Muckross Stables was great. My granddaughters were up at 7 am and out by 7:30 to play with the pups. Nice rooms and the hospitality was outstanding. Loved the pastural setting and the Irish Cob horses. Wonderful place, perfect for kids we spent 3 nights there with our 2-year old daughter, who was enthusiastic of sheep, horses, goats and puppies!. Rooms are spacious and clean and breakfast is delicious. Maureen is extremely kind and helpful we forgot a jacket and our daughter's teddy-bear and she posted them back to us. Lots of opportunities of hiking and cycling all around. I definitely recommend Muckross Stables B&B! We spent 2 nights in this B&B and we would have spent some more! It's a very quiet place. The rooms are comfortable. The breakfast is marvellous: 4 choices and very yummy! BRAVO. We will recommend this address. à la campagne au milieu des près et des animaux : les enfants ont adoré les chiots, les poneys et chevaux. very nice place, spacy and tidy rooms, tasty breakfast It would be perfect, if the owner would offer an included riding time for guest kids in the late afternoon. Excellent location, peacefull, fantastic view on the horses in the morning and in the evening, lovely puppies, very friendly hosts, excellent breakfast, clean rooms and a really nice atmosphere. We loved it! Very comfortable and quiet accommodation, beautiful house with stunning surroundings, delicious breakfast... and really close to the Killarney park and lake. If we come to Ireland again, we won´t hesitate to stay here again. Muckross is a great place to relax. The breakfast is excellent. Highly recommend. I loved the quiet countryside setting, The service, accommodations and hostess were everything I expected. For me the horses, sheep and all the other animals added to the charm. I was not totally disappointed, but not sure I would stay here again. I'm just giving things the way they were for my family as I know everyone had different needs. I thought I was booking 2 en-suite rooms. We got one and my daughter had a small room no bathroom. Not a biggie sharing a bathroom, but not what I expected. NO WiFi. Did not work in any part of the house. This is a biggie if you need to stay connected to work, with teenagers, or want to use for travel purposes. Breakfast was delicious!! Check the time of the year as if you are early season, they may not have all animals. We could not ride here, but they will arrange with another stable. You are off the beaten track as far as restaurants, etc. We did enjoy the restaurant about a half mile down the road. The drive into town is not far, but parking can be a bear. We did enjoy walking the property and the area around. My 16 year old actually enjoyed playing with the puppies and chasing the sheep. Check in was a little different, but unlike other reviewers, we knocked on the family private door and were greeted. When Mary did have a second, she engaged in a bit of a chat. Make sure you have cash as they do not accept credit cards as stated in website. As I said, not a bad stay, but you'll have to decide what your own needs dictate. Expensive and not very comfortable for the two rooms we got instead of a family room. Very small with view on the back side of the house. A deception. This was our least favorite place of accommodation during our 13 day vacation. VERY basic for the money spent when compared to other places we stayed. We had read reviews stating that the owners were rude and unaccommodating. Our impression was more that they were in a constant state of "rush", hence had no time to provide quality service. We were never even given the names of our hosts at any point. Our room had one towel, so we had to take additional from one of the vacant rooms. Even on the morning of departure, we had to knock on the door that the hosts were always behind which was marked "Only ring bell in case of emergency" just to pay them, as they immediately disappeared again right after breakfast was served. Being in the heart of Killarney National Park, there are tons of B&B's to choose from. We will be staying elsewhere the next time. 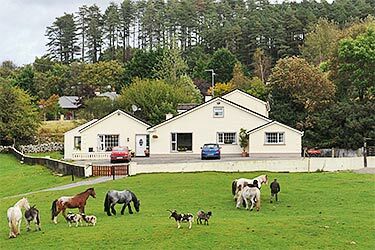 We stayed there in July and it was absolutely wonderful.I am a horsey person and just loved the horses walking around at night.Lovely ride through the Killarney national forest.Wonderfull memories.Our room was comfortable and it is very conveniently located. We enjoyed our recent one-night stay. The Irish breakfast was top notch. We enjoyed visiting the animals. My only suggestion to the B&B owner is that they provide toiletries soap/shampoo for guests. I can't do this place enough justice by only telling you how lovely this place is!!! We chose this place because we wanted to go horseback riding while we were staying there which was fantastic by the way and I must say this place did not let me down at all! Every night they let the horses and donkey roam their yard and you can go right up to them and pet them! They have a sort of a petting zoo with a wallaby, emu, deer, puppies, shetland pony etc! The family running the B&B are nothing if not welcoming and incredibly nice! You can choose from a menu every morning for breakfast I absolutely recommend the Full Irish Breakfast and the room we stayed in was comfortable and just lovely! I would most certainly stay here again if I ever find myself in the Killarney area again! Maureen and Padrih and their daughter were perfect hosts: the stable was immaculate; the ride scenic; animals 'interesting". We had called back in March and spoke with Maureen: she assured all would be well and it was! Very quiet, friendly and convenient jumping off place for the Ring of Kerry and the national park. Warm authentic host. very calm, comfortable, thanks a lot for friendly reception. From the moment we turned down the driveway and were greeted by rolling green pasture lawn and some sheep draped across the road, we knew we would like it. Beds were comfortable, breakfast had choices so that if one is tired of eggs, pancakes or continental style offerings were available. My friend loves to ride and went out twice and absolutely raved about riding in the national park--beautiful pictures! Easy to get around as right off of Ring of Kerry and near to the center of town in Killarney, which looked incredibly tourist-heavy. Never seen so many buses outside of a station before! Maureen and her family are sweet and love what they do. The animals are adorable and thriving. Any family with small children would love their time here. The kids and adults! were entranced by the petting zoo. We ended each night with a trip to see the puppies. Fun! We loved it! The setting is so beautiful even though it is very close to the town. The proprietor, Maureen, is delightful and so is her family. We are returning for 10 days for the 4th time in June 2013 and are really looking forward to it. Great place to stay. lovely b and b. clean and comfy and the breakfast is exelent. tennant are really helpfull and nice. Beautiful view and landscape. A lot of different animals around the farm. Delicious breakfast. All across the board it was an excellent experience and stay! We were very happy with our choice and would strongly recommend the place or stay there again ourselves. Our stay at Muckross Stables was our favourite in Ireland. We loved the location and being right beside Killarney National Park was beautiful. The bed we slept on was divine. The best sleep by far. We loved waking up to see the animals horses grazing out in the field. It was so peaceful and relaxing, a little piece of heaven in the middle of Ireland. The breakfast was freshly made by our host, and delicious. We went out on a two hour horse ride and again our hosts made the whole experience very pleasant. I'm not an avid rider, and they matched me with the perfect horse and were very good at making me feel reassured about the journey ahead. It was a wonderful adventure. Very friendly and helpful hostess, lovely breakfasts, wonderful surroundings. The only negative thing is that the walls are thin - it is noisy when people come late at night.